You may associate all-inclusive holidays with Caribbean holiday packages, but the concept has slowly gained it’s share in Southeast Asia. offer package deals where 3 daily buffet meals, unlimited snacks and soft drinks, and sometimes certain alcohol types and brands are included in the price. Some resorts offer free activities and kids’ clubs on top of that. The concept of all-inclusive holidays was first developed by Club Med more than 60 years ago. The idea was – and still is – to give customers a worry-free and convenient holiday, where the total price of the entire holiday experience is pretty much known. There is no need to bargain for prices, no need to carry money anywhere inside the resort premises, and no need to worry about where and what to eat. There are plenty of water sports, games, and activities for the kids, and professional staff to watch over them. 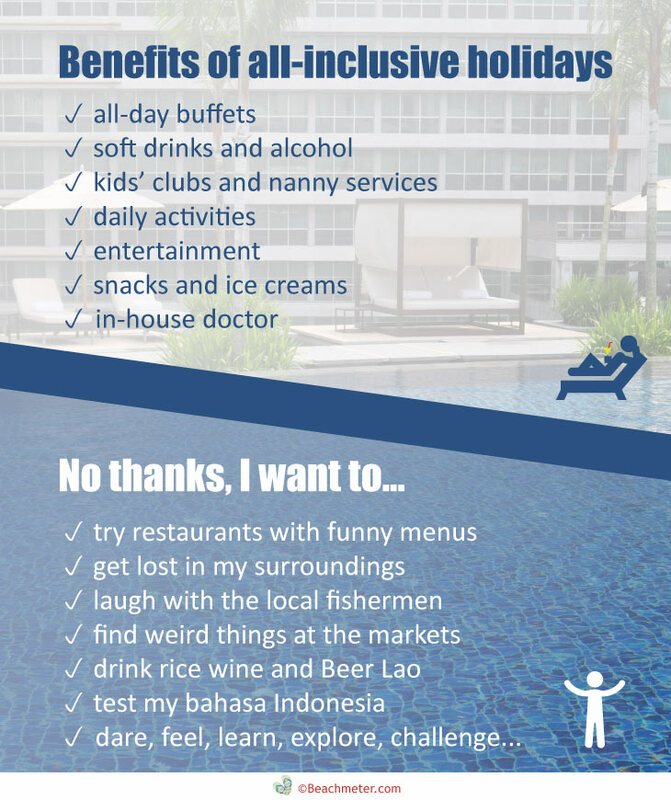 Benefits of all-inclusive holidays or “no thanks”? More and more resorts in Southeast Asia are offering all-inclusive packages, but in most cases, we don’t recommend buying an all-inclusive holiday. Southeast Asia is such a joy to experience. It’s easy, convenient, fun, and safe compared to many other travel destinations. There are exciting sights, beautiful nature, spiritual and historic monuments, great and varied food options, and lots of impressions waiting for you to explore right around the corner. So why would you spend your holiday in this exciting setting by staying within resort walls and alienating yourself from the culturally rich society you are visiting? Would you miss out on these great experiences by staying within resort boundaries? In short, leakage refers to the phenomenon that none of the tourism dollars you spend are benefiting the society around you. Your flight, your travel agent, and your resort are most likely foreign or non-local companies that extract their profits from the destination. None of your tourism dollars stay locally – thus the term leakage. Why is this a problem? Your host society has to pay for the extra stress you put on water, infrastructure, nature, and energy resources, food prices rise, and that old favorite picnic spot at the beach might very well be reserved for resort guests. Bummer. There are good reasons, especially for families, to stay at all-inclusive resorts, and of course all-inclusive hotel operations who contribute to society and run with sustainability in mind do exist. 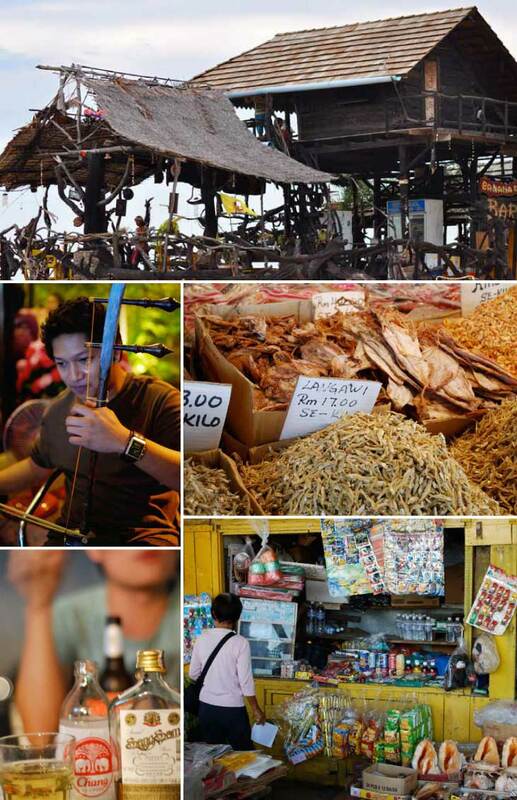 But the mentioned benefits of all-inclusive holidays are less relevant in Southeast Asia, since this area serves as an ideal region for individual travelers to collect unique memories. If you like to read more about the issues concerning all-inclusive holidays, have a look at this great article from responsibletravel.com: Should all inclusive resorts be banned?